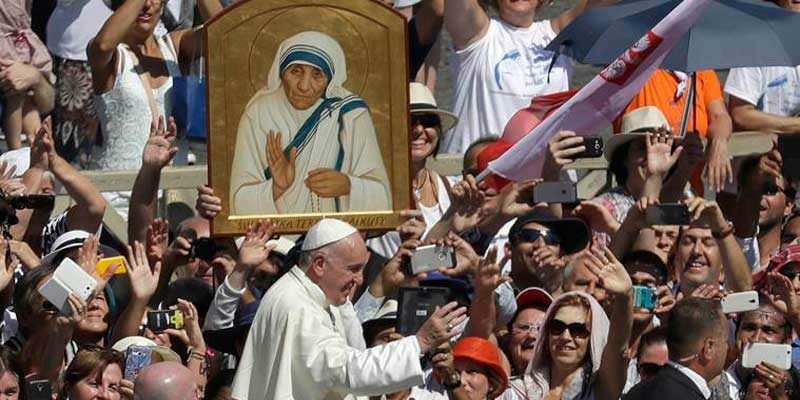 It was a typical Pope Francis touch, and one in keeping with the extraordinary life story of Saint Teresa of Kolkata, as the Catholic nun became on Sunday. On papal orders, 1,500 homeless people were brought to Rome overnight on buses from around Italy to be given seats of honour at the canonisation of Mother Teresa, revered around the world for her work with the destitute and dying. Also at the Vatican was a Naples pizza maker and 20 of his workers, invited to provide lunch for the homeless men and women. The meal was served by 250 nuns and priests of the Sisters of Charity order. Many among the massive crowds in and around St Peter’s Square were celebrating what were, in their eyes, two saints: Mother Teresa and Pope Francis, who has dedicated his papacy to mercy, humility and serving people on the margins. In his homily during the special two-hour mass, Francis said the diminutive Albanian nun had, by her actions, shamed world leaders for the “crime of poverty” they had created. “She bowed down before those who were spent, left to die on the side of the road, seeing in them their God-given dignity; she made her voice heard before the powers of this world, so that they might recognise their guilt for the crime of poverty they created,” the pope said on the steps of St Peter’s Basilica, beneath a huge portrait of Mother Teresa. He urged this “emblematic figure of womanhood” and “tireless worker of mercy” to be a model of holiness for Catholics and others. In the crowd, Francis Gojcaj, from Detroit, was in no need of the pope’s exhortation. “No one can be as good as Jesus Christ, but she’s pretty close,” he said as he shielded his seven-month-old daughter, Georgiana, from the sun.